Metal Messenger - Metal & Hard Rock News: VICIOUS RUMORS Streaming New Live Song! VICIOUS RUMORS Streaming New Live Song! 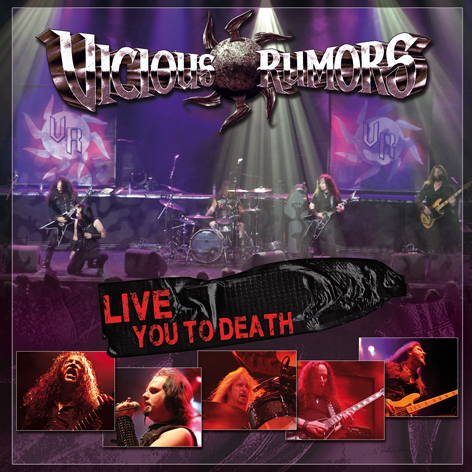 The legendary US metal band VICIOUS RUMORS are back with a thundering new live CD called: Live You to Death. The power of the band`s live show is now finally caught on CD! 2011 was the year the band stormed European stages with their highly acclaimed studio album Razorback Killers playing 92 shows in 12 months! This new live album was recorded last December on the European tour with the mighty Hammerfall. It features 11 songs , 9 classics and 2 very special studio recordings including ''Sign of the Southern Cross" by Black Sabbath and "Running Wild "by Judas Priest. Today the band is offering a sneak preview of Live You to Death with an exclusive stream of the track "Abandoned". Get a first listen HERE and be sure to pre-order the album on Amazon. Recorded by Pontus Norgren of Hammerfall, mixed by Juan Urteaga and produced by Geoff Thorpe the live album will be released through Steamhammer/SPV in Germany on November 23rd, Europe November 26th and in the USA November 27th!